If you’ve thought about homeschooling for more than a few seconds then you’ve probably looked into a curriculum. And that’s when your brain exploded and you had a full-on panic attack. Why? Because there are just so many choices when it comes to curriculum! As a homeschooler I’ve had to choose curriculum after much research, deliberation, and angst. I hope and pray that we’ll enjoy what I chose and that it will work well for our family. Curriculum is an investment so I advise you to choose carefully and wisely. 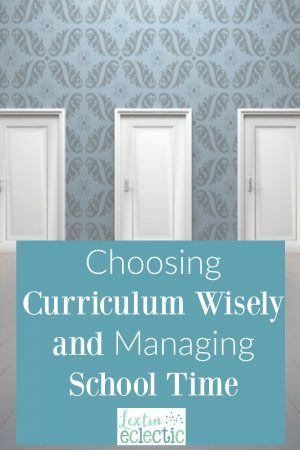 When you are researching through the plethora of curriculum choices be sure to think about a few things before you put all the items in your cart and hit that “checkout” button. You don’t need to have every moment filled in your school day. It is ok to choose curriculum that takes a minimal amount of time. Curriculum can still be thorough even if it takes a short time to teach. You can’t use every curriculum out there. There are so many wonderful choices. You can’t use them all. You may want to try to find ways to fit them all in but it’s not practical. Sometimes you have to choose which one you think is best for your family and then stop looking at the other options. There is not one perfect curriculum for you (or for anyone else). When you find a curriculum that is a good fit for your family, stick with it. You don’t have to keep looking for something newer or better. There will always be other great options but none of them will be absolutely perfect. So, learn to be content when you find a curriculum that you and your children both enjoy. Some “extras” may have to wait until the summer or another school year. One of the wonderful aspects of homeschool is that you can add in various electives that may not be available in your local schools. You can tailor your curriculum to your child’s interests. However, you shouldn’t try to cram multiple electives into every year. Some will have to wait for later years as you focus on the basics and still leave time for exploration and other pursuits. There is only so much time in a day (or in a school year). When you choose a curriculum you have to consider how much time you have to work with each child in a school day. A curriculum might be wonderful but if it has so many components that you spend all weekend planning and the entire school day trying to complete every assignment and project, then it might not be the best fit for you. I’ve learned a few things during our homeschool journey as I attempt to choose curriculum that works well for us. Playtime and exploration is an important part of a homeschool day. I can spend an inordinate amount of time searching for a perfect curriculum that does not exist. Time consuming does not necessarily mean thorough. A homeschool day does not need to last 7 hours. I can set limits on the amount of extras and electives that we include in each year. I can change or revamp my plan at any time during the year. I can be confident in my curriculum choices if I enjoy teaching and my kids are learning.